Relax by the water at Bellevue Beach and Beach Mansikkalahti. 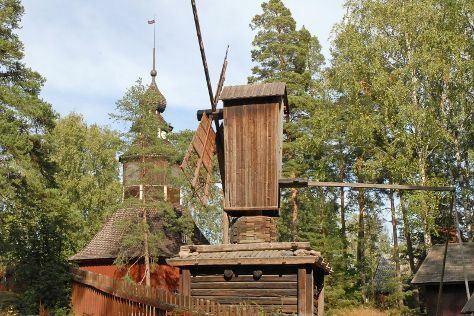 Get some historical perspective at Seurasaari Island and Open-Air Museum and Uspenskin Cathedral (Uspenskin Katedraali). Get out of town with these interesting Helsinki side-trips: Porvoo (Cathedral of Porvoo, Runeberg Park, & more), Arboretum Mustila (in Elimaki) and Teijo national park (in Pernio). Spend the 17th (Mon) exploring nature at Nuuksio National Park. Spend the 23rd (Sun) exploring nature at Valkmusa National Park. Next up on the itinerary: take in the spiritual surroundings of Rock Church, wander the streets of Linden Esplanade, explore the striking landscape at Hiidenvuori, and admire the masterpieces at Kansallisgalleria. To find ratings, reviews, where to stay, and tourist information, go to the Helsinki trip builder site . If you are flying in from Mexico, the closest major airport is Helsinki Vantaa Airport. In June in Helsinki, expect temperatures between 21°C during the day and 11°C at night. Finish up your sightseeing early on the 27th (Thu) so you can travel back home.